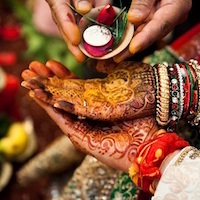 Wedding is a one-time experience and the look that one opts for the wedding day remains with one forever. We have seen the actresses in movies as brides a lot of times and loved their look as well but how about the look that they opted for in their real-life wedding. Let me warn you beforehand. Do not show these to your husband-to-be. The bridal look of these actresses will set the bar high for you. We have compiled a list of the bollywood actresses who looked stunning on their wedding day. Let’s find out who they are. Well, not to make you jealous but to inspire you for your wedding day. The Miss World wore a golden- yellow Kanjivaram Saree on her wedding day. The saree was designed by the top-class designer Neeta Lulla who adorned it with Swarovski crystals and gold threads. Aishwarya went all traditional on her wedding day with a bun adorned with gajra. 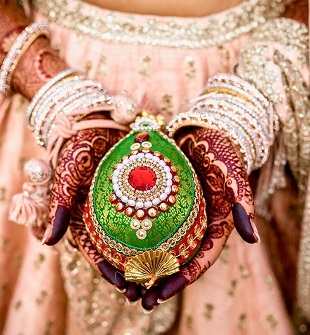 Her jewellery was gold and had perals and emerald studded in it. Genelia D’Souza looked absolutely stunning in the Red and Gold Saree designed by Neeta Lulla. Just like a typical Maharashtrian bride, Genelia adorned herself with the Maharashtrian jewellery like the haar, nath along with a pearl chain on his forehead. She looked adorable on her wedding day. The zero figure lady looked ravishing on her wedding day wearing a wine and green colored saree embellished with Swarovski crystals. The ensemble was designed by Tarun Tahiliani. The jewellery looked amazing and she looked a typical Mangalorean bride. The bong shell wore a Red and Gold Lehenga on her wedding day designed by Sabhyasachi. She wore was a heavy Kundan jewellery with a bright red bindi on her forehead. This Bengali beauty looked nothing less than wow . The beautiful Dia Mirza wore an emerald green and gold colored ensemble which was a masterpiece by the ace designer Ritu Kumar. She wore a jhoomar as a part of her jewellery and looke like a princess of the Mughal era. 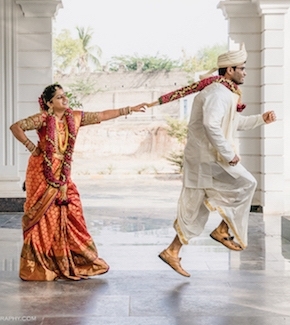 Anushkha Sharma wore a blush pink lehenga on her wedding and challenged the conventional tradition of wearing colors like red, pink, yellow in the Indian wedding. She looked jaw-dropping gorgeous with the choker necklace, matha patti and earrings. Asin looked divine in the heavily embellished ensemble by Sabhyasachi lehenga on her wedding. She wore pastel colored lehenga which looked modern and chic. Her gold jewellery with red beads need to be given special mention to complete her sophisticated look. These bollywood beauties looked nothing less than the beauties of the heaven. We have seen all of them adorned in bridal outfit and jewellery in the movies but in real life, they proved that they are much more experimental and beautiful than they appear on the big screen. These actresses looked stunning on their wedding day and are inspirational for the brides to be too. Are you not inspired? If you found the article helpful, give your suggestion in the comments section below and let us know which actress according to youlooked the best on her wedding day.